Shin Min Ah was invited to the celebration opening of Valentino's Fifth Avenue flagship in New York which included a special viewing of the brand's SALA BIANCA 945 collection back in December. 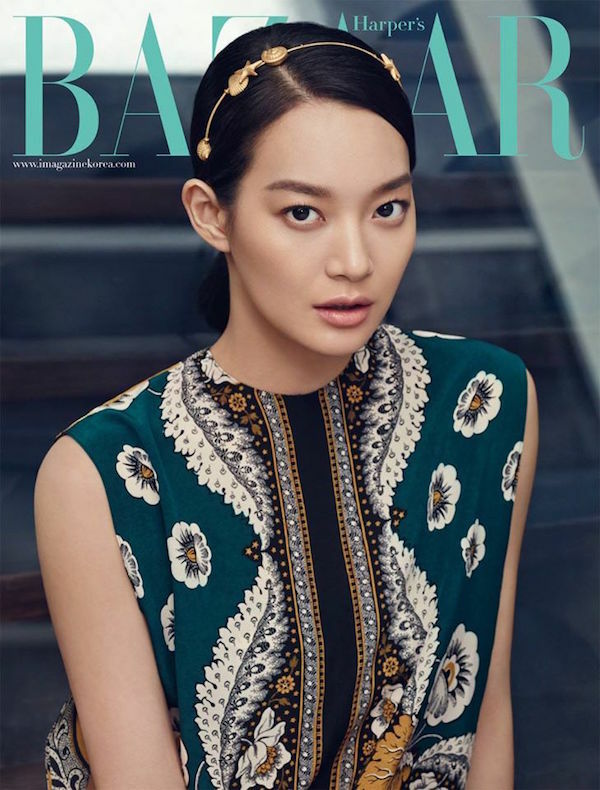 The lovely actress also collaborated with Harper's Bazaar Korea on this gorgeous editorial set in an airy Manhattan loft where she models a selection of looks from Valentino's Spring 2015 RTW collection. Min Ah's elegant demeanor perfectly complements the Roman inspired collection and she looks beautiful in this stunning sequined starfish embellished organza gown as well as other pieces featuring bold decorative eyelets, baroque inspired prints and exquisite embroidery. She is so wonderfully expressive on camera that it came as a surprise to see how shy she actually is in real life when she appeared on Running Man with Jo Jung Seok to promote their film My Love My Bride. I re-watched a few episodes of My Girlfriend Is A Gumiho recently and I honestly couldn't imagine anyone else besides Shin Min Ah and Lee Seung Gi as Gumiho and Dae Woong. They were both so cute in that drama. So beautiful this editorial and model, Have a lovely weekend. I have never heard about her, but I am not a cinemaddict and probably that's the reason! But she definitely is an eye candy! I really like her and I think she's very beautiful! Not to mention that she looks great in every outfit! Wonderful editorial, Rowena! Wow she looks flawless. What an amazing and beautiful editorial. I love the clothes she wears. Wish everything were mine. I'm also jealous. She's too pretty. I would love to see her acting skills too. Yes we both should practise more yoga but at least you do it once a week and I haven't at all. I always find excuses. I have to pull myself together. Happy Friday Rowena!! My girlfriend is a nine-tailed fox! Love her so much! She is so beautiful! I love this editorial... stunning collection!!!! She looks beautiful and has a great sense of style. This is such a beautiful editorial! That drama sounds interesting, and what a fun editorial, loving the knits at the end. Kinda crazy but in a good way. These designs look SO AMAZING on her! That picture of her in the blush gown is gorgeous! Love how natural and fresh she looks! GORGEOUS! She has such a strong and elegant look. I actually got a gold crystal headband somewhat similar to the one she is wearing! I'm totally charmed by her beauty and elegance! I love the clothes and the photo shoot location. Stunning photos. She's beautiful and so are the photos, thanks for sharing this! I am sure even without all the makeup and styling she would look gorgeous! Stunning shots, Rowena! I'm into k-pop & k-dramas, but somehow can't appreciate Running Man. My hubby is into it & I joined him once, but didn't find it interesting tho. What a beautiful editorial! She's a beauty; I love how they styled the outfits, pretty without being overwhelming. Have a lovely weekend, Rowena! She's so pretty! I especially love the dress she's wearing in the second picture. Shin Min Ah is so beautiful! All the photos are gorgeous. My favorite is the champagne gown. That dress is stunning. She's perfect! I love those shoes that lace up to the knee. oh i love all the pieces she's wearing! She's beautiful as always, I haven't seen her in anything other than My Girlfriend is a Gumiho but I agree, she and LSG are perfect for that drama. I hope you are keeping warm today! oh my, that powder pink sequin star gown! I'm in love.